Are you living a crazy lifestyle where you have to go from one place to another with no time in between to look after yourself? Too much work to be done in too little time? Welcome to the 21st century where being busy has taken precedence over everything – even looking after yourself. There are few things as annoying and painful as a toothache, though, and they hardly come with a warning. Not being able to go for regular dental checkups and not taking care of your oral hygiene can have disastrous effects that require immediate treatment. Thanks to the 24 hour emergency dentist clinics, you can have a dental appointment for yourself and your loved ones at any time of the day or night. Now, you don’t have to suffer the pain of another night tossing and turning in your bed and popping pain killers because of a wisdom tooth. 24 hour emergency dentist clinics cater to all of your dental hygiene and dental treatment needs, including cosmetic dentistry. Any minor or major dental emergency can be taken care of by specialized professionals, and they also offer different methods of payment for your convenience. Most of these centers are open from Mondays to Saturdays, and some of them are open even on Sundays. It is recommended that you call them for an appointment or any information that you may require. Olathe is located in northeastern Kansas, and with a population of over 125,000 people, it is the fourth most populous city of the state of Kansas. It has been ranked number 11 by CNN and the Money magazine on the list of the 100 best cities to live in the United States. 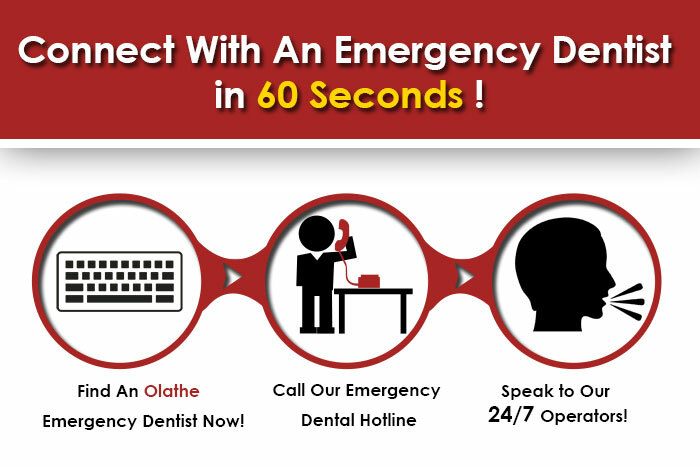 With 30% of the residents below the age of 18, Olathe, Kansas, needs to have proper and top rated emergency dentists that can deal with any emergencies that need to be taken care of. Here is a list of some reputed dental clinics that you can contact for your dental needs. Description When traveling through the Olathe, there are many ways in which a dental emergency could quickly present itself. If you’re having a dental emergency it’s important to get help fast. Call our hotline and we’ll help you find a dentist near you fast! At Family Dental Care, P.A., Dr. Ira Neufeld and staff will ensure that you get the best dental treatment and are satisfied with it. With the focus primarily on cosmetic dentistry, including fixing chips, cracks, stains, and teeth whitening, the team at Family Dental Care P.A will ensure that your smile is not far away. Waters Davidson Dentistry is available to take care of any dental trauma that you are facing. They offer a whole range of different treatments that will make sure that your pain is taken care of. They also offer different payment options, so call them today to book for an appointment or for more information. Here are other links to emergency dentist cities in Kansas.